The Global Airport Leaders’ Forum (GALF) is one of the world’s most influential knowledge-sharing platforms for the airports industry. 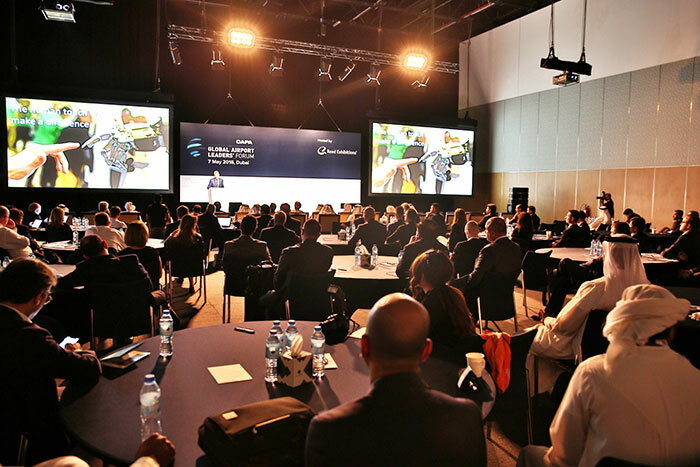 A new revamped agenda for its seventh edition in Dubai in 2019 hosts an engaging line-up of speakers and the agenda reflects the changing aviation landscape and future technologies. Key airport industry decision makers will flock to Dubai International Exhibition and Convention Centre (DICEC) for the three day forum (29 April – 1 May) taking place alongside the 19th edition of Airport Show. Airport Show and its co-located events will be held under the patronage of His Highness Sheikh Ahmed bin Saeed Al Maktoum, President of Dubai Civil Aviation Authority, Chairman of Dubai Airports and Chairman and Chief Executive of Emirates Airline and Group. The knowledge-enhancement initiative is themed Leading Collaborative Sustainable Aviation Growth, reflecting the future growth path of the industry which supports US$2.7 trillion of the world’s Gross Domestic Product (GDP) and carries over four billion passengers and 62 million tonnes of freight a year. The International Air Transport Association (IATA) expects 7.8 billion passengers by 2036, almost double the current numbers, and airports and airlines will have to adopt smart technologies rapidly to cater to this unprecedented growth volume. The Middle East is expected to welcome 517 million passengers by 2036, and 450 million passengers by the Arabian Gulf airports, including over 100 million passengers in Dubai, by 2020. GALF is a pivotal moment in the year where industry leaders and experts from around the world will gather to discuss common challenges, partnership opportunities and chart the way forward for the region’s aviation growth. The three-day event will feature pressing topics including: Smart Airports and Sustainability, Airport Privatization Models, Building Non Aeronautical Revenue Systems and the Future of Blockchain in Aviation, amongst other topics. The first day of the Forum will be dedicated to Smart Airports while the second and third days will focus on Air Traffic Control (ATC) and Airport Security respectively. A strong advisory board team helped shape the topics for discussion, focusing on key strategic issues and challenges facing airports as new technologies come online. The agenda is designed to help regional airport leaders make fast business adaptions, implement smart innovations and embrace collaborative partnerships with airlines to adapt and flourish in the digital age. The initial line-up of speakers announced by the organisers includes Major General Mohammed Ahmed Al Marri, Director General of General Directorate of Residency and Foreigners Affairs (GDRFA–Dubai); Hussain Al Fardan, Head of Innovation Center & Innovation Oasis at Dubai Customs; Ivano Iannell, CEO of Dubai Carbon Centre of Excellence; Erik Scherff, Head of Business Technology at Amsterdam Airport Schiphol; Kristian Budolfsen, Director, Epinion Aviation; Jesper Skou, CEO, GAL ANS; Ryyan Tarabzoni, CEO, Saudi Air Navigation Services (SANS) and Alex Bristol, CEO of skyguide. The Forum will highlight the most influential innovations that are shaping the design, features and day-to-day operations of the modern airport. One of the key topics, Blockchain, is a market that will be worth US$23 billion by 2023. Blockchain technology has captured the imagination of companies across industries, including airlines as it is capable of easing functions such as flight operations, monitoring and maintenance and repair overhaul. Blockchain is fast emerging as the priority technology for future exploration amongst airport and airline CIOs globally. Dubai has ambitious plans to be the world’s first city fully powered by blockchain by 2020 and the emirate is making persistent efforts to be a global leader in blockchain adoption. By 2020, Dubai wants all visa applications, bill payments and license renewals to be transacted digitally using blockchain. A smart airport is not about complete digitization. It is important to have the ability to make the most of innovation to facilitate a more convenient and hassle-free journey for passengers travelling through airports. The global smart airport market is expected to reach close to US$13 billion by 2019 and US$14.87 billion by 2021. Like Blockchain, Smart Airports are at a developing stage but will grow at a healthy growth rate in the coming decade. In the Middle East, the smart airports market will be worth US$850 million by 2019. Airports in the UAE are leading the way when it comes to smart technology adoption and key features of the future smart airport will be discussed at GALF. To request more information from Dubai Airport Show 2019, please complete the form below.